We play games: board games, video games and even those peg games that restaurants have while you're waiting for your eggs and toast. Lately, we've been playing Divinity: Original Sin 2 from Larian Studios, which was released on Sept 14, 2017. Hunter and I played the first Divinity: Original Sin and were pleasantly surprised by how much freedom the game offered. From often brutal combat encounters to janky spell exploits, the game seemed to constantly invite you to figure out how to break something. And the expansive combinations of status effects, such as setting fire to oil puddles or to poison clouds to create an explosion, established this strong sense of player ingenuity that's typically found in only tabletop roleplaying games, where the rules can be more fluid. We played OS1 for several months and absolutely adored it. So when we missed the Kickstarter for Divinity: Original Sin 2, we made sure to snag copies of the game as soon as it hit Early Access. We dabbled, we chuckled and we teleported enemies into raging fires. And then we waited for the full release. Our patience has paid off, and somehow Larian Studios has struck that divine balance of creating a sequel with improved mechanics, more features and still maintaining the beauty of the first game. Playing OS2 feels like we're playing the next chapter of the first game. Even our favored power sets still follow the same rules and strategies, and yet, there's so much more to explore, to learn and to master. New elemental and status effects mean there are new combinations to beware, and the new armor system means we have to plan out our stronger abilities to produce the highest potency. All of that planning, assessing and exploiting is of course doused in "Hey, throw me a save right quick; I'm about to do something stupid." Typically, we stick pretty heavily to letting our actions have their consequences. If we get caught stealing, then we pay up or fight and move on. If we make a reckless decision that gets an important non-playable character killed, we resolve to find another solution. And yet, we continually find ourselves in combat encounters, looking at the big pile of corrupted poison gas and wondering how bad things will get when we throw that fireball -- they get really bad. The game seems to encourage making bad decisions, laughing at the fallout and reloading to a safe spot with your newly acquired wisdom. 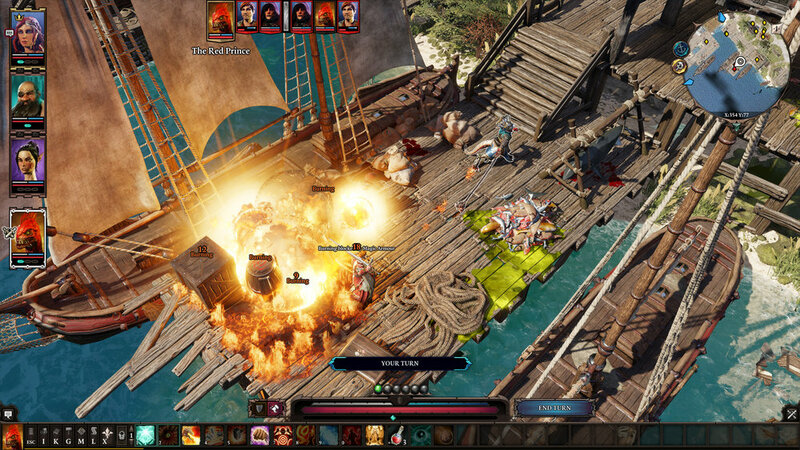 That beautiful combination of quirky characters, powerful abilities and tactics, and tabletop RPG freedom makes Divinity: Original Sin 2 a cherished gem. Definitely pick this one up.